Directions are for size Small. Changes for sizes Medium, Large, X-Large, and XXLarge are in parentheses. 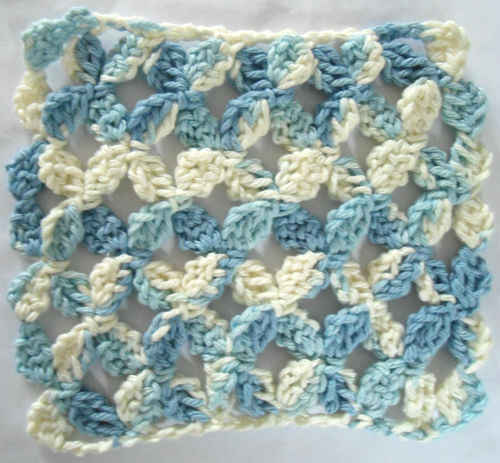 over and draw through both loops on hook (the “single crochet”). “ch”), yarn over and draw through both loops on hook; repeat from * for desired number of stitches. Dbl-V (double V) = (Dc, [ch 2, dc] twice) in indicated space. Inc-V (increase V) = (Dc, [ch 2, dc] 3 times) in indicated space. through all 3 loops on hook. V = (Dc, ch 2, dc) in indicated stitch or space. traditional foundation ch because Fsc provides more elasticity. 4. 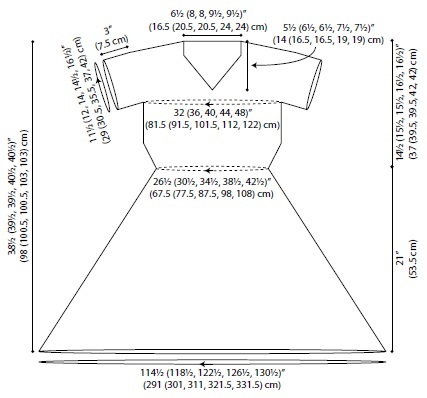 Garment will lengthen significantly when blocked. Fsc 39 (43, 43, 47, 47). Row 1 (right side): Ch 5 (counts as dc, ch 2 here and throughout), V in first sc, place marker in ch-space just made, [skip next sc, V in next sc] 4 times, place marker in last ch-space made, [skip next sc, V in next sc] 11 (13, 13, 15, 15) times, place marker in last ch-space made, [skip next sc, V in next sc] 4 times, place marker in last ch-space made, ch 2, dc in last sc again, turn—22 (24, 24, 26, 26) ch-spaces, 4 markers placed. 1. The 10 (12, 12, 14, 14) Vs at center between marked Vs form the back neck. 2. The markers indicate corners in which stitches will be increased. Row 2 (increase at corners): Ch 3 (counts as dc here and throughout), V in first chspace, Inc-V in next marked ch-space and move marker to the center ch-space of the Inc-V, [V in each ch-space to next marked ch-space, Inc-V in marked ch-space and move marker to the center ch-space of the Inc-V] 3 times, V in last ch-5 space, dc in 3rd ch of beginning ch-5, turn—30 (32, 32, 34, 34) ch-spaces. Rows 3 and 4 (increase at corners): Ch 3, [V in each ch-space to next marked chspace, Inc-V in marked ch-space and move marker to the center ch-space of the Inc-V] 4 times, V in each remaining ch-space, dc in top of turning ch, turn—46 (48, 48, 50, 50) ch-spaces at the end of Row 4. Row 5 (increase at front neck): Ch 5, dc in first dc, [V in each ch-space to next marked ch-space, V in marked ch-space and move marker to the ch-space of the V just made] 4 times, V in each remaining ch-space, V in top of turning ch, turn—48 ch-spaces. Row 6 (increase at corners): Ch 3, [V in each ch-space to next marked ch-space, Inc-V in marked ch-space and move marker to the center ch-space of the Inc-V] 4 times, V in each remaining ch-space including last ch-5 space, dc in 3rd ch of beginning ch-5, turn—56 ch-spaces. Rows 7 and 8: Repeat last 2 rows—66 ch-spaces at the end of Row 8.
marked ch-space and move marker to the center ch-space of the Inc-V] 4 times, V in each remaining ch-space, V in top of turning ch, turn—58 ch-spaces. Row 6 (increase at corners): Ch 3, [V in each ch-space to next marked ch-space, Inc-V in marked ch-space and move marker to the center ch-space of the Inc-V] 4 times, V in each remaining ch-space including last ch-5 space, dc in 3rd ch of ch-5, turn—66 ch-spaces. Row 7 (increase at front neck): Ch 5, dc in first dc, [V in each ch-space to next marked ch-space, V in marked ch-space and move marker to the ch-space of the V just made] 4 times, V in each remaining ch-space, V in top of turning ch, turn—68 ch-spaces. Rows 8 and 9: Repeat last 2 rows—78 ch-spaces. Row 10: Ch 3, [V in each ch-space to next marked ch-space, V in marked ch-space and move marker to the ch-space of the V just made] 4 times, V in each remaining ch-space including last ch-5 space, dc in 3rd ch of ch-5, turn—78 ch-spaces. marked ch-space and move marker to the center ch-space of the Inc-V] 4 times, V in each remaining ch-space, V in top of turning ch, turn—58 (60) ch-spaces. Row 6 (increase at corners):Ch 3, [V in each ch-space to next marked ch-space, Inc-V in marked ch-space and move marker to the center ch-space of the Inc-V] 4 times, V in each remaining ch-space including last ch-5 space, dc in 3rd ch of ch-5, turn—66 (68) ch-spaces. Row 7 (increase at front neck): Ch 5, dc in first dc, [V in each ch-space to next marked ch-space, V in marked ch-space and move marker to the ch-space of the V just made] 4 times, V in each remaining ch-space, V in top of turning ch, turn—68 (70) ch-spaces. Rows 8–9 (11): Repeat last 2 rows 1 (2) times—78 (90) ch-spaces at the end of Row 9 (11). Row 10 (12): Repeat Row 6—86 (98) ch-spaces. marked ch-space and move marker to the center ch-space of the Inc-V] 4 times, V in each remaining ch-space, V in top of turning ch, turn—60 ch-spaces. Row 6 (increase at corners): Ch 3, [V in each ch-space to next marked ch-space, Inc-V in marked ch-space and move marker to the center ch-space of the Inc-V] 4 times, V in each remaining ch-space including last ch-5 space, dc in 3rd ch of ch-5, turn—68 ch-spaces. Rows 7 and 8: Repeat last 2 rows—86 chspaces at the end of Row 8. Row 9 (increase at front neck): Ch 5, dc in first dc, [V in each ch-space to next marked ch-space, V in marked ch-space and move marker to the ch-space of the V just made] 4 times, V in each remaining ch-space, V in top of turning ch, turn—88 ch-spaces. Row 10 (increase at corners): Ch 3, [V in each ch-space to next marked ch-space, Inc-V in marked ch-space and move marker to the center ch-space of the Inc-V] 4 times, V in each remaining ch-space including last ch-5 space, dc in 3rd ch of beginning ch-5, turn—96 ch-spaces. Rows 11 and 12: Repeat last 2 rows—106 ch-spaces. Row 9 (11, 11, 13, 13) (increase at front neck): Ch 5, dc in first dc, [V in each chspace to next marked ch-space, V in marked ch-space and move marker to the ch-space of the V just made] 4 times, V in each remaining ch-space, V in top of turning ch, turn—68 (80, 88, 100, 108) ch-spaces. ch-space of the V just made] 4 times, V in each remaining ch-space including last ch-5 space, dc in 3rd ch of ch-5, turn—68 (80, 88, 100, 108) ch-spaces. Row 11 (13, 13, 15, 15) (right side): Ch 5, dc in first dc, [V in each ch-space to next marked ch-space, V in marked ch-space and move marker to the ch-space of the V just made] 4 times, V in each remaining ch-space, V in top of turning ch, slip st in 3rd ch of ch-5 at the beginning of this row to join into a round, do NOT turn—70 (82, 90, 102, 110) ch-spaces. With right side still facing, skip ch-spaces to next marked ch-space (front left corner), skip marked ch-space, skip ch-spaces to next marked ch-space (back left corner), turn (wrong side now facing), join yarn in marked ch-space (back left corner). Round 12 (14, 14, 16, 16) (wrong side): Ch 3, skip first ch-space, [V in each ch-space to next marked ch-space, V in marked ch-space, place marker in ch-space just made] 3 times, V in each remaining ch-space to beginning, dc in beginning ch-space; join with hdc in top of turning ch to complete beginning V (joining hdc counts as ch-space), place marker in beginning ch-space just made, turn—70 (82, 90, 102, 110) ch-spaces. Round 13 (15, 15, 17, 17) (right side): Ch 3, skip first ch-space, *V in each ch-space to next marked ch-space, V in marked chspace, ch 1, insert hook under 2 strands in the side of the dc just completed near the top of the dc, draw up a loop, yarn over and draw through one loop, yarn over and draw through 2 loops (beginning Fsc made), Fsc 5 (2, 5, 2, 5) more times (underarm foundation complete), skip the next 13 (15, 17, 19, 21) ch-spaces to next marked ch-space **, V in marked ch-space; repeat from * to ** once, dc in beginning ch-space; join with hdc in top of turning ch, remove markers, turn—44 (52, 56, 64, 68) ch-spaces. Round 1 (wrong side): Ch 3, skip first chspace, *skip first sc of underarm foundation, V in next sc, [skip next 2 sc, V in next sc] 1 (0, 1, 0, 1) time(s), skip remaining sc of underarm foundation **, V in each ch-space to next underarm foundation; repeat from * to ** once, V in each ch-space around, dc in beginning ch-space; join with hdc in top of turning ch, turn—48 (54, 60, 66, 72) ch-2 spaces. Rounds 2-10: Ch 3, skip first ch-space, V in each ch-space around, dc in beginning chspace; join with hdc in top of turning ch, turn. between V sts, dc in ch-space of next V **, V in next 8 (10, 10, 12, 14) ch-spaces; repeat from * to ** once, V in next 12 (13, 16, 17, 18) ch-spaces; repeat from * to ** once, V in next 8 (10, 10, 12, 14) ch-spaces; repeat from * to ** once, V in next 4 (5, 6, 7, 7) ch-spaces, dc in beginning ch-space; join with hdc in top of turning ch, turn—44 (50, 56, 62, 68) ch-2 spaces. turn—44 (50, 56, 62, 68) ch-2 spaces. Round 13 (decrease): Ch 3, skip first chspace, V in next 7 (7, 9, 9, 10) ch-spaces, *dc in next ch-space, V in next 8 (10, 10, 12, 14) ch-spaces, dc in next ch-space **, V in next 12 (13, 16, 17, 18) ch-spaces; repeat from * to ** once, V in next 4 (5, 6, 7, 7) ch-spaces, dc in beginning ch-space; join with hdc in top of turning ch, turn—40 (46, 52, 58, 64) ch-2 spaces. Rounds 14-16: Repeat Round 12 three more times—40 (46, 52, 58, 64) ch-2 spaces. Round 17 (increase): Ch 3, sk first ch-space, *V in next 2 ch-spaces, Dbl-V in next ch-space, V in next 2 ch-spaces, Dbl-V in next ch-space, V in next 3 ch-spaces, Dbl-V in next ch-space, V in next 2 ch-spaces, Dbl-V in next chspace, V in next 3 ch-spaces, Dbl-V in next ch-space, V in next 2 ch-spaces **, Dbl-V in next ch-space; repeat from * to ** once, V in beginning ch-space; join with hdc in top of turning ch to complete beginning Dbl-V, turn—52 ch-2 spaces. Round 17 (increase): Ch 3, skip first chspace, V in next 2 (3, 2, 3) ch-spaces, Dbl-V in next ch-space, *V in next 3 (3, 4, 4) ch-spaces, Dbl-V in next ch-space, V in next 3 (3, 4, 5) ch-spaces, Dbl-V in next ch-space, V in next 2 (4, 4, 4) ch-spaces, Dbl-V in next ch-space, V in next 3 (3, 4, 5) ch-spaces, Dbl-V in next ch-space, V in next 3 (3, 4, 4) ch-spaces, Dbl-V in next ch-space**, V in next 3 (4, 3, 4) ch-spaces, Dbl-V in next ch-space; repeat from * to ** once, dc in beginning ch-space; join with hdc in top of turning ch, turn—58 (64, 70, 76) ch-2 spaces. Round 18: Ch 3, skip first ch-space, V in next 7 (9, 9, 11, 11) ch-spaces, place marker in last ch-space just made, *V in next 9 (9, 11, 11, 13) ch-spaces, place marker in last ch-space just made, V in next 8 (10, 10, 12, 12) ch-spaces, place marker in last ch-space just made **, V in next 9 (10, 11, 12, 13) ch-spaces, place marker in last ch-space just made; repeat from * to ** once, V in next 1 (0, 1, 0, 1) chspace(s), dc in beginning ch-space; join with hdc in top of turning ch, turn. Round 19 (increase): Ch 3, skip first ch-space, *V in each ch-space to next marked ch-space, Dbl-V in marked ch-space; repeat * 5 times, V in each ch-space to beginning, dc in beginning ch-space; join with hdc in top of turning ch, turn—58 (64, 70, 76, 82) ch-2 spaces. Note: The markers are moved in the next round so that the increases are evenly spread over the skirt. Round 20 (even): Ch 3, skip first ch-space, V in each ch-space around, dc in beginning ch-space, hdc in top of turning ch; move each marker over by 2 ch-spaces to the left and up 2 rounds to ch-space of round just completed (hdc counts as ch-space), turn. Round 21 (increase): Repeat Round 19. Rounds 22-57: Repeat Rounds 20 and 21 eighteen more times—172 (178, 184, 190,196) ch-2 spaces at the end of Round 57. Round 58: Repeat Round 20. With right side facing, join yarn in 2nd ch of one underarm foundation. Round 1: Ch 3, [skip next 2 ch of foundation, V in next ch] 1 (0, 1, 0, 1) time(s), V in next space formed by the dc row edge of V that is connected to underarm foundation, V in each of the 13 (15, 17, 19, 21) skipped chspaces, V in space formed by next dc row edge, skip first ch of foundation, dc in same ch as joining; join with hdc in top of turning ch, turn—17 (18, 21, 22, 25) ch-2 spaces. Rounds 2–6: Ch 3, skip first ch-space, V in each ch-space around, dc in beginning chspace; join with hdc in top of turning ch, turn. With right side facing, join yarn in 20th (22nd, 22nd, 24th, 24th) foundation ch at center back of neck. Round 1: Ch 1, sc in each ch of foundation, *working in ends of rows, work 3 sc in each beginning ch and 2 sc in edge of each dc ** of left side of V-neck; repeat from * to ** for right side of V-neck placing marker in first sc made (at center front neck), sc in each remaining ch of foundation at back of neck; join with slip st in beginning sc, turn—94 (108, 108, 122, 122) sc. Round 2: Ch 1, sc in each sc to marked sc, sc2tog, sc in each remaining sc; join with slip st in first sc, turn—93 (107, 107, 121, 121) sc. Round 3: Ch 1, sc in each sc around including in sc2tog; join with slip st in first sc. Weave in ends. Hand wash and lay flat to dry.